Konad recently release five new stamping plates, and I was lucky enough to receive one of them from Nail Polish Canada. The plate I got was M91 which features a range of cat designs. Here is the design I created with it. I used Picture Polish Beige and Black for the base colours and stamped with Konad special stamping polish in both black and white. Here is the plate image (courtesy of Nail Polish Canada). 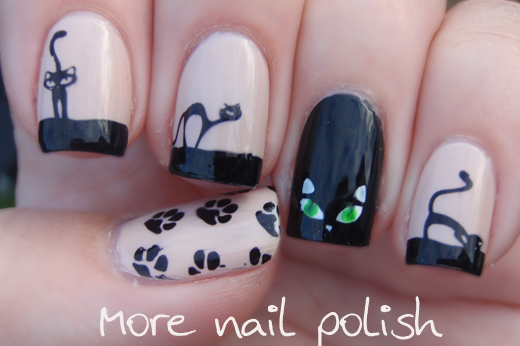 I used the centre image with the paw prints on my thumb and four of the single images, one on each nail. For the image of the eyes, I stamped in white, then used a dotting tool and Ulta3 Jelly to dot in the eyes. Jelly is a jelly green polish so the black lines on the eyes still showed through. The quality of Konad plates is always excellent, smoothly engraved and the designs pick up very easily. I'm a crazy cat lady, so I think this plate is just the cutest thing ever. Stamped in black, these little black kitties look just like Slinky Malinki. I love Slinky Malinki and so both my kiddos. Check out the Nail Polish Canada website for details on this and the other four new konad plates. So glad you liked it. I'd not heard of Slinky Malinki until I had kids. The rhyming stories about that mischievous little black cat are super cute, and we've read them so much that we know them by heart! This is too perfect. I bought this plate back in June and I can not get it to stamp well. It's my first Konad and I was new to stamping so I never returned it and I think I got a bum plate. Ok, so I totally tried to duplicate this with my own plate and a different background color. It didn't turn out quite as well but I sincerely thank you for posting this. 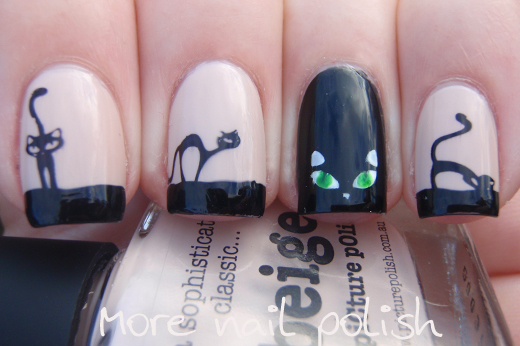 I searched high and low for someone who had used the plate so I could get an idea of what to do with the little cat images (I would have never though to do the eyes on a black nail) and now I will practice and maybe someday be able to do this as well as you did. I googled for some ideas on using this plate too, but there really wasn't many. 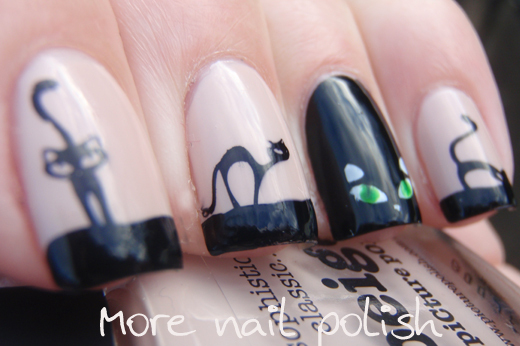 I think the kitties are really cute, and I think I will use some with Halloween nail art too. I hope you are able to get your plate to work better for you. Ooooo, I may have to purchase this plate even though I'm not all that into stamping. I'm also a crazy cat lady with a special fondness for black kitties, and this plate reminds me so much of my current little black diva cat, Sophie. 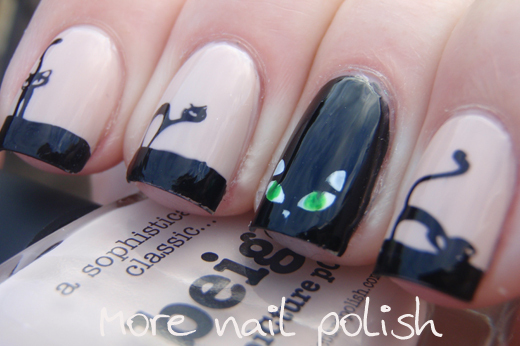 Thanks for creating such an adorable cat mani for us! Ha ha, there is something special about little black cats, isn't there! Totes adorbs. I love cats.